You’ve married the man of your dreams and you’re floating on air. It’s a fairytale wedding day and everything you see around you has an air of magic. 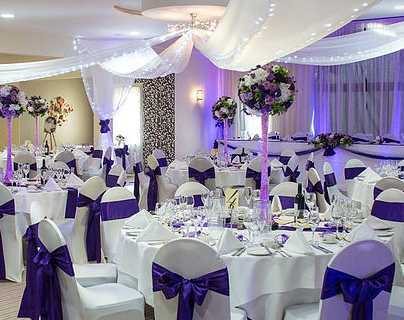 The wedding venue decorations contribute to that magic and there’s no simpler way of putting your individual stamp on a room than decorating it with chair covers and balloons in your bridal colours. Chair covers transform any room instantly: choose white, ivory or black and finish them off with stunning organza or satin sashes in your bridal colours. If you want an extra special touch, add a butterfly, a flower or a diamante brooch to the bow at the back of the chair. If you want complicated balloon decor– and you can get everything from pillars and arches to balloon sculptures – leave that to an expert. But you can transform any room yourself with a clutch of helium-filled balloons as table centres. For the best effect, use a maximum of two colours and make sure each balloon in the group stands at a different height. Think about how you’re going to secure them and make sure they suit your other table decorations – you could even tie them to the backs of chairs. When you’re choosing your balloon expert, ask to see photographs of work they have done and, if at all possible, find out whether you may be allowed to look at a room they have decorated for someone else, whether it’s for a wedding or another celebration. 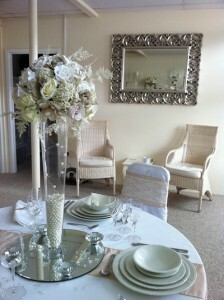 Other room decorations are equally important, see our separate sections on flowers and favours. Whether it’s simply hire of venue decor, complete venue styling and wedding planning or even a last-minute emergency ‘rescue’ service, Lovingly by Lesley has a huge variety of special touches which will make your wedding stand out from the crowd. Winner of both the 2018 and the 2016 South West Wedding Awards for Wedding Enhancements, Lesley also offers handmade bespoke wedding stationery and those extra wow factor items such as light up LOVE letters, fairylight backdrops, candy carts and ferris wheel sweet carousels.